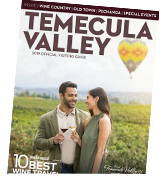 Temecula is the place where you can make connections, refresh and have fun. This hidden gem has been selected by Wine Enthusiast as a Top 10 Wine Travel Destination! It’s not all business when you plan a meeting in our casual and picturesque region. You will find your attendees will be inspired to “work” especially if the conference room is surrounded by lush vineyards. With our variety of relaxed and refreshing venues, arranging a unique event could not be easier. Temecula facilities include a high-tech casino property offering expansive views of the valley, peaceful resorts set among rolling fairways, casual wineries with barrel-boardrooms and traditional, yet friendly hotels. The Visit Temecula Valley can offer you assistance with planning just about every detail of your event. From site selections to proposal requests, itinerary planning to activity arrangements, we are dedicated to ensuring your event in Southern California Wine Country is a success. Visit Temecula Valley can offer you assistance with planning just about every detail of your event. From site selections to proposal requests, itinerary planning to activity arrangements, we are dedicated to ensuring your event is a success. From inspiring venues to diverse activities and exciting events, the easily accessible Temecula Valley has Southern California meetings covered. Offering a combined 2080 guest rooms and over 96,000 square feet of flexible meeting spaces. Discover a variety of unique experiences from wine blending to hot air balloon rides. We promise a rich new experience and lots of engaging fun for all of your attendees. Getting to Temecula Valley, Southern California Wine Country is easy. Temecula Valley is located off the I-15 freeway approximately 60 minutes north of San Diego, CA and 90 minutes south of Los Angeles, CA. Get to know the Visit Temecula Valley sales team. If you have any questions regarding groups or meetings in Temecula Valley, our sales team would love to help! You can contact our representatives directly or submit RFP. We look forward to hearing from you. Take a deep breath. Your meeting is now in session.